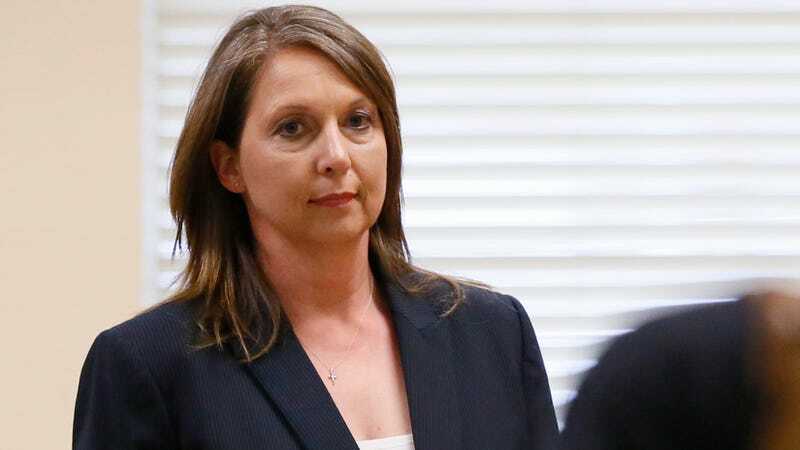 In what Tiffany Crutcher is calling a small “victory” for her family, a major homicide investigators conference has rescinded their invitation to have former Tulsa, Okla., Officer Betty Shelby speak at its event. Shelby, who shot and killed unarmed black motorist Terence Crutcher in 2016, was scheduled to talk about “Surviving the Aftermath of a Critical Incident” at the Southeastern Homicide Investigators Conference in Baton Rouge, La. Shelby was arrested for Crutcher’s killing but was ultimately found not guilty by a jury in 2017. While she was fired from her job as a Tulsa police officer, Shelby—a living testimonial to the enduring power of white women’s fragility and privilege—soon secured work as a Rogers County sheriff’s deputy. For more than a year, Shelby has been teaching a class to law enforcement officers on “surviving” critical incidents—which, in her own words, is more or less about surviving black people’s anger. According to Tulsa World, SEHIA released a statement on Sunday saying it had invited Shelby for an exercise that would have attendees evaluating how they would have investigated Crutcher’s case. “We realize now there are people around the country who do not understand why we would present this case or how our investigators could learn and benefit from hearing the case presentation which led to her arrest, prosecution and ultimate acquittal,” the organization said, nakedly implying that they do not understand why people would be upset about the idea of someone advising on managing the aftermath of her own fatal ineptitude. Shelby’s husband, Tulsa Police Sgt. Dave Walker, was also scheduled to speak alongside her at the conference this week. It’s unclear whether SEHIA gave him the “About that invite ...” treatment as well. Earlier last week, a group of civil rights leaders and Crutcher’s family wrote to SEHIA asking them to revoke Shelby’s invitation. Speaking to The Root, Terence’s twin sister, Tiffany Crutcher, said the rescinded invitation was a step in the right direction. “After being relentless and unwavering in our pursuit to seek justice for Terence, it feels good to know that your voice has power if you use it,” she said. But the work is far from over, Crutcher cautioned, noting that “real police reform” and accountability still hadn’t come to Tulsa. “Blacks are two times more likely than whites to be arrested and five times more likely to be victims of excessive force by police,” Crutcher said, citing a Tulsa Equality Study. “The question now is, will Mayor G.T. Bynum do the right thing like SEHIA and stop defending Betty Shelby? “My family is trying really hard to turn our pain into purpose, yet the mayor continues to fight us,” she said, noting they had high expectations of Bynum when he was elected in 2016. In his recent “State of the City” address, Bynum touted the city’s community policing projects and a new sobriety center meant to divert people from jail, but his plan for making Tulsa safer hinges on a more-is-more approach of strengthening the city’s police force. “Two years ago, when I was sworn is as mayor, we didn’t have enough police officers to follow every beat,” Bynum said. Since his election, 90 more Tulsa officers have been funded.